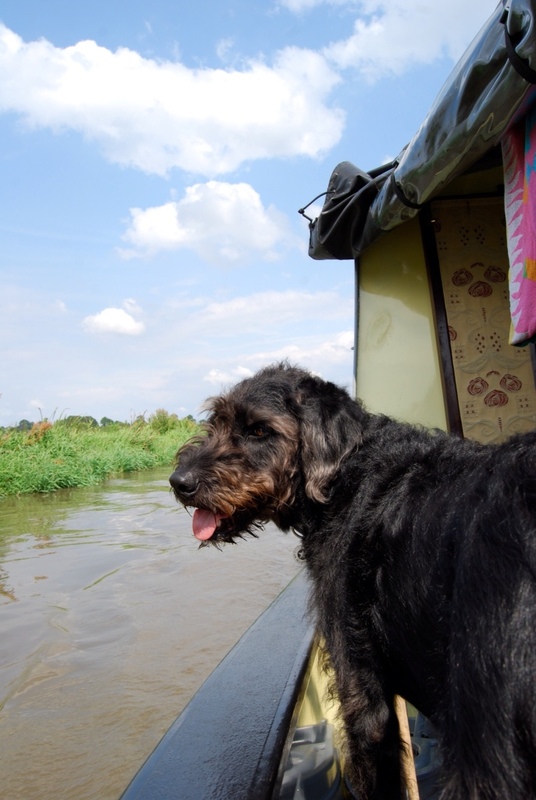 Ever wondered what it would be like to go on a canal holiday with your dog? Well, wonder no more. I've given it a go so you don't go in blind and I've even come up with ten top things to think about before you book. 1) Canal boats are small. I know it sounds obvious, but when you're told your boat is 32ft long it sounds bigger than it really is, particularly when you consider the boat is only a few feet wide. We took two dogs on our 32ft boat – the smallest in the company's fleet – and we spent most of the holiday tripping over them. If you own Leonbergers, then it's probably not the holiday choice for you. 2) Someone has to drive. If you want to actually travel any distance on your holiday, it will involve someone driving the boat for fairly long periods of time. On our boat, there was no seating at the driver's end so the two of us spent most of the holiday apart. Not a huge problem as long as you're not on a lover's getaway, but something to think about. Take a good book. 3) Not everyone is a natural driver. Don't expect that you will be able to share the driving equally. I was a more-than-hopeless captain of our pretty narrow boat. I managed to beach the boat no less than twice and both times in pretty spectacular fashion. One of those times I managed to get stuck on a bank on the opposite side to both the dogs and my friend, and had to punt myself off. No, I looked nothing like one of those effortless gondoliers in Venice. Think more harassed, more swearing and less singing. Did I mention it's virtually impossible to stop? You have to put the boat into reverse and then deal with the fact that in reverse you have absolutely no steering. I'm not very good at not being in control and the less said about that the better! My friend, Lucy, on the other hand was a natural so, lucky her, she got to do the lion's share of the driving… and apparently quite enjoyed it, so there you go. 4) Dogs can jump. More specifically, they can jump off the boat. I recommend life jackets for the less able bodied canine companions in your life (and perhaps for the less able bodied humans, too). In our experience, the dogs were not that interested in jumping into the water, but instead made leaps at the bank when they thought they could make it. Perhaps this was a reflection of my driving skills? The elderly dog on our crew jumped off once without so much of a sound and just watched as we chugged away. 5) Locks. They're an integral part of the canal boating process, so if you have the option, give it a go. However, watch a few people do it first and be prepared, if you're the person doing the legwork, to bring your best muscles. Or, if you are a girl and have very little shame, your best, 'Oh no, what do I do now' face. We did seven locks in a day. By last one, I was taking any help offered. You might judge me, but when you give it go imagine doing a lock with only two people when one has to drive the boat. Then times that by seven. Apparently some people do them with just one. They're either superhuman or insane. 6) Canal pubs are a godsend. They are also very popular, so think about where you are going to try to moor way in advance, so you don't have to float by the cheery people drinking wine and beer in the warm and then trudge two miles back along a very muddy towpath past all the better prepared people's boats. They are also really helpfully marked on canal maps. 7) Put your stuff inside. This is for two reasons. First, people steal. It's a fact of life. Second, it will fall off the boat. We lost a mooring pin in a lock. Caused all sorts of chaos when we came to stop for the night. 8) Walking the dogs is easy-ish. You have all the towpath you could possibly want and it can also give you a chance to blow away some cobwebs by walking alongside the boat if you don't want to lose time. Wear boots or wellies though because towpaths ain't what they used to be. After all, horses don't walk them anymore. Also, watch the dogs. Rory thought it would be a good idea to check the boat from IN the canal. 9) A basic understanding of mechanic and boats is not essential, but it helps. Diesel engines like to warm up for fifteen minutes before they get going and propeller shafts like being greased every morning. There is also a 'weed hatch', which, despite the name, is not used to hide illegal substances. It's for putting your arm elbow deep in canal water to pull dead/discarded/mangled items off the prop so you don't overheat the engine. Your introduction will cover all this and there should be notes on the boat, but it's quite handy to know rather than flicking through a massive manual in a challenging situation. 10) Have fun. Mooring up in a quiet spot with tired dogs at your feet, drinking some wine, reading a little, makes all the stressy bits more worthwhile. And although canal boats are small, these days they are well equipt – gas ovens and hob, coal burner for the winter, covers for the outside areas, everything for all eventualities. Our canal boat even had a TV but limited coverage (apparently a common problem now that we've gone digital) but a working DVD player, so take some films with you if that's your thing. I'd do it again… just give me some time to build up my energy. Relaxing canal holiday? Ha! I clicked onto this blog via your Evernote Moleskin post and boy am I glad I did! I’m so sorry… but I laughed until I cried at number 4!